System accommodates a wide range of drum sizes for process flexibility. System is 50 1/2” wide x 67” deep x 131” high. Drum filler base includes a stainless steel gravity roller conveyor. Filler base conveyor features adjustable drum centering brackets. Drum fill adaptor constructed from stainless steel, all welds continuous TIG, and includes a compressible food grade seal for dust-tight filling. Drum fill adaptor actuated by dual pneumatic cylinders. Fill adaptor includes an inlet stub and a dust vent port with filter sock for displaced air during fill cycle. Robust tubular stainless steel frame construction. Unit includes a stainless steel gain-in-weight scale system. 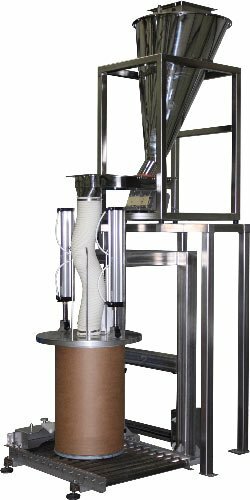 Integral vibratory feeder features two filling speeds for increased filling accuracy. Remotely mounted digital weight indicator (not shown) sends signals to communicate with customer’s existing PLC when target weight is achieved.